A fun supply for quirky t-shirts, toys, books, local events, and more! Visit our shop in Fairfax, Ca or visit us online using the "shop" page! Game Night is a wonderful event where games, some classical, some made by us, some strategy, some RPG are played . If you are looking for something fun and creative, rather than rigid this is the place for you, Fridays 5:00 - 7:00; Ages 10-infinity. There is no charge, but POT LUCK SNACKS TO SHARE ARE ENCOURAGED! Please Call the Store to Confirm Game Club is Happening! Want your evening out to be fun for your kids as well? While parents are enjoying a night out, kids can join us in our workshop room for art and games! Saturday nights from 6:00-9:00 pm, 25$ per child or 40$ per pair of siblings. Ages 6-12 please. Food included. This year's kid's night MC is Revolution 9's own Amin Al-Jamal! Artist, musician, writer, and game master extraordinaire, Amin is currently a student at College of Marin. Everyone loves buttons and at this party you can custom make your own! Put them on jackets, hats and backpacks. We will provide design and production assistance for up to 10 people. Party goers can make up to 10 buttons each! Following the activity, use the space for the remainder of your party—we have a wii, an i-pod doc, and a kitchen so you can stay for 2hours and have fun! $195 includes buttons, design assistance, and use of the back-room for 2 hours. Our most popular Birthday party, the T-Shirt Design party gives you the chance to create your own artistic shirt to wear home! An artist will help you with your design and kids will use stencils, t-shirt paint and markers to bring their shirt to life. Then use the back room to feast on cake, listen to music, play on the wii, and otherwise have fun! $295 includes t-shirts for up to 10 people, design assistance and use of the back room for 2 hours. 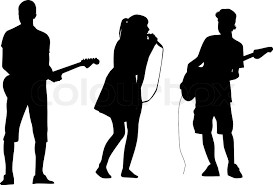 Rock Band workshops for kids and teens.